You can probably get away with never learning the slip-slip-knit (SSK) technique if you only plan on knitting rectangular blankets, baby blankets, and scarves. But, at some point, you might want to diversify the items you produce and give your knitting some shape. To do this, you need to learn how to increase or decrease stitches. An important type of decrease is the SSK. This left-leaning decrease reduces two stitches to one. The SSK makes a decrease that slants to the left and is often paired with knit-two-together knit (K2TOG), which is a right-slanting decrease. It is an easy technique to learn. The basics of this stitch are also used in several other stitches as well. It is almost identical to a cast-off method known as binding off. Many beginning knitters use the binding off method to finish their earlier creations. It is often used as a way to cast off scarves. 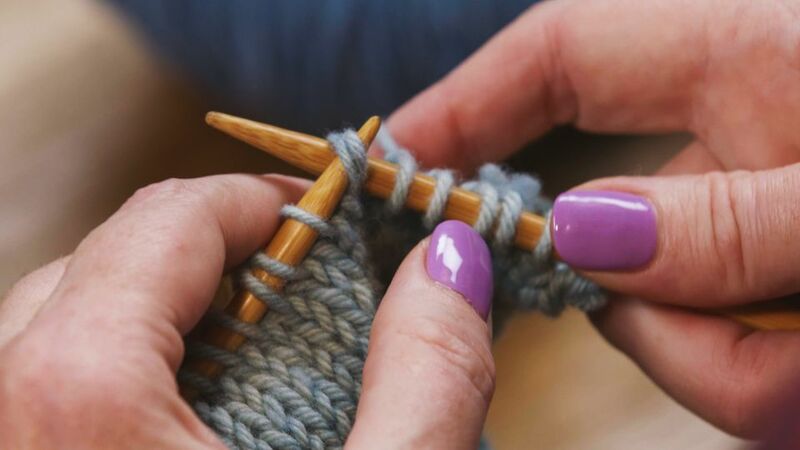 If you are new to knitting, learning this stitch will allow you to follow several patterns and help build your knitting confidence. To execute this decrease, slip the first stitch as if to knit, slip the second stitch as if to knit, then slide the left-hand needle into the front part of both stitches and knit them together. Actually, you are doing more than just slipping and knitting, you are decreasing a stitch by slipping two stitches and then knitting them together through the back loops. Some people also perform this decrease by slipping the first stitch as if to knit and the second stitch as if to purl, working them together through the front as with the standard decrease. This makes it look a little more like a knit-two-together decrease, so if you're mirroring decreases on a garment you might want to try it. Decreasing stitches is one of the main ways to add shape to a knitted garment or project. As you progress in your knitting, you will find that slip-slip-knit is one of the most common ways to decrease stitches. Other forms of decreasing will give you a different look and feel, but this method is so easy there's no reason not to use it—if that is what a pattern calls for. ​Baby booties and socks will often use this slip-slip-knit technique when shaping the ankle part of the garment. Stuffed animals also often use this technique to help shape the animal parts. To balance out the left-leaning slip-slip-knit, you may be asked to pair it with the K2TOG knit, which leans to the right. Together, these two techniques help even out the stitches so they don't look crooked. These stitches are said to be mirrors of each other. Once you have mastered this common technique, then you also know how to slip-slip-purl, as it's the same basic stitch only with a purl instead of a knit. With the SSK in your repertoire, you can now go on to knit many other patterns incorporating different shapes.